Ask yourself when the last time you went to www.google.com and the search results were “slow”. Indeed, have you noticed any real slowness over the last say 10 years? I haven’t. Obviously the number of indexed web pages has gone from say 1 billion to well over a trillion in that time but the end user is still presented with search results as fast as ever (if not faster!). Scale is not a problem for Google. Now look at your own Data Centre. I bet over the same period of time you’ve experienced growth and therefore scaling issues, especially with regard to compute and storage resources. Lots of money spent – possibly different vendors over that time and millions of dollars spent, users complain of ‘slowness’ and the infrastructure gets blamed….and you realise these issues are not going away anytime soon! So why can Google get it right but Enterprises continue to struggle with this fundamental problem? I could be flippant and say that the traditional storage vendors (I’ll pick on them due to the massive costs they impose on Enterprises) have no interest in improving the situation. Sure, they can say they will add Flash drives (PCIe or SSD based) to their arrays and the performance of their arrays would no doubt improve, but this is the same old dance you’ve done before (and of course they’ll charge you for it). The real problem is that the old architecture is being re-sold to you each time, so it the same problem will always reappear a few years down the track. When your new flash array fills up or the controller hits it’s limit then you have to repeat the process again and get newer drives or more capacity controllers (forklift upgrade! )…..and the storage vendors love it don’t they! More of your cash on hardware and on professional services. The poor old Enterprise IT Manager has been the frog that has been boiled slowly over the years. Spending a LOT of money with your storage vendor has somehow become the norm and expected. Remember too that even if you upgrade your array, your servers (compute) are still separated from it via a network of some kind. Reads and writes have to go over this network. To quote an old adage from the network world “It’s the latency, stupid!”. Latency kills performance. That will never change. So the only real thing you can do is to minimize it. So, not only do you have a latency issue, you also have to re-buy servers too when the time comes. Google overcomes the latency issue by moving the storage and compute to the same ‘layer’. They ‘converged’ the compute and storage – essentially eliminating the network latency between those components. Clever. Then they scaled. Done. Ask yourself why web players like Google don’t bother with SAN arrays. To put it simply they could see a long time ago that the above limitations and failings of that architecture. The scaling problems and cost implications were obvious too. 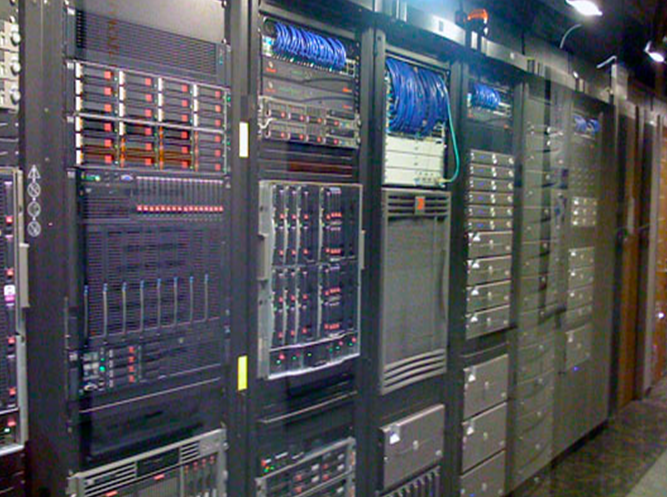 With regard to your own Data Centre – do you want your Data Centre to continue to look like 1990s technology like this? 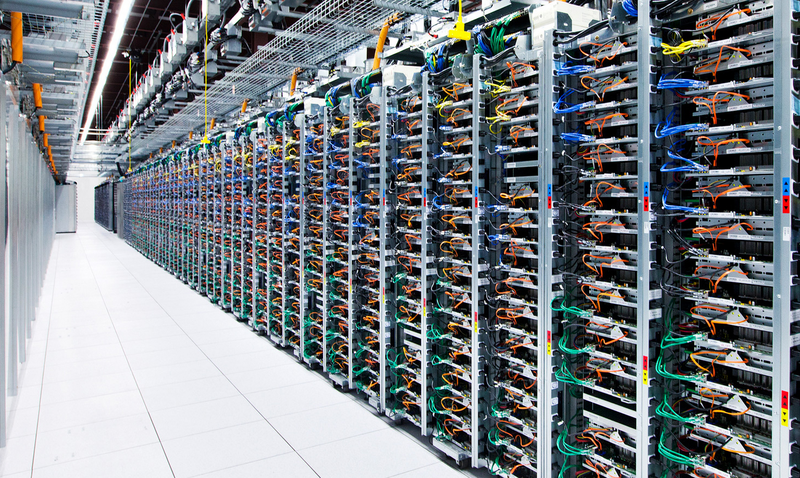 …Or would you like it to look something along the lines of a Google-like Data Centre? Google had some very smart little vegemites working for them to come up with a file system that could scale to whatever they needed….and they did it well. To make it work for them they had to write their own custom applications to work on the infinitely scalable file system they created. Of course, your own Enterprise apps within the Data Centre are not able to be re-written – but there is another way to take advantage of this architecture and bring it to the Enterprise and break out of the ‘boiled frog’ paradigm. Imagine if someone could take the same Google-like idea, run it on commodity x86 servers, use a virtualisation hypervisor which we all know (eg. vSphere), combine all the storage per server in a single (if you want to) NFS datastore which scales infinitely – just keep adding more servers when you need to? Then you could run your apps on it (via your virtual machines) and never have to worry about forklift upgrades ever again. If you run out of compute, add more nodes. If you ever run out of storage, add more nodes. Because the storage controllers are now in software, they scale as well at the same time…if the controller seems overwhelmed, add more vCPU or vRAM or add another node to share the burden. Each node (or server) brings more and more resources to the cluster – quickly, easily and at a known cost and performance line. This is what the Enterprise has been waiting for….a system built from the ground up for virtualisation that once in place will scale forever only when you need it. Suddenly, your engineers can not worry about ‘business as usual’ tasks managing a data centre infrastructure and instead can start diverting their brain power to innovate in other areas – your IT department could be viewed as an enabler to the business rather than a cost drain. When you don’t have to worry about how something runs, only then you can improve. You just want to ‘turn a key’ and it ‘goes’. Suddenly your data centre will start to look like Google and you’ve jumped out of the boiling water. So, if you are still investing in stand-alone storage arrays in 2013 then you are suffering on two fronts: 1) Re-investing in old 1990s/2000s architecture and 2) missing the performance benefits, cost savings and scalability of converged compute and storage solutions bring. Also, don’t be fooled by the big vendors pushing their ‘converged’ solutions. If they have any component that is a ‘hardware SAN’, they are simply taking what they sell individually now and trying to sell it to you in a different form factor…bundled with other compute and network items. Remember – if the compute component is in a different part of the ‘rack’ then it isn’t really converged is it? If it still looks like the old array/data centre photo as above, then it is the same old dog…and you will still be the same old boiled Enterprise IT frog….as I was in my previous IT life before joining Nutanix. I should point out that individually those old components from the big vendors are fine (as per the old architecture model) – my point is that when they try to shove it all together in one ‘rack’ and try to convince you it is ‘converged’ they are being sneaky and certainly not Google-like. If you want to differentiate yourself from the competition and take advantage of the Software-Defined Data Centre – or SDDC – (mirroring the Google model) then you really need to look at Nutanix for any virtualisation project (server infrastructure, big data, VDI). By the way, some of those Google smart little vegemites I mentioned …they now work for Nutanix creating the software smarts to make this a reality. Now in 10 years’ time, you will look back and realise your scaling issues have gone, performance never dropped and you saved money. You became your own Google in your own Data Centre. This entry was posted in Nutanix and tagged Google, infrastructure, nutanix, Scale, SDDC on February 10, 2013 by Cameron Stockwell.